Radial head fractures and dislocations are traumatic injuries that require adequate treatment to prevent disability from stiffness, deformity, posttraumatic arthritis, nerve damage, or other serious complications. Radial head fractures and dislocations may be isolated just to the radial head (and neck) and the lateral elbow (and proximal forearm), or they may be part of a combined complex fracture injury pattern involving the other structures of the elbow, distal humerus, or forearm and wrist. Radial head and neck fractures and dislocations have been treated by closed and open methods. Early attempts at closed treatment with casting resulted in stiffness and loss of function in the elbow. Consequently, treatment has evolved so that only patients with fractures stable enough to allow early motion undergo closed treatment, while essentially all other patients are treated with a form of surgical treatment. The joints are controlled by the ligamentous anatomy of the elbow. The elbow joint (ulnotrochlear joint) is constrained by the medial collateral ligament, which has well-defined anterior, posterior, and transverse bundles. The elbow is also constrained by the lateral collateral ligament, which is poorly defined, and the radial collateral, lateral ulnohumeral, and accessory collateral ligaments provide stability. The radioulnar joint is constrained by the annular ligament. The neurovascular structures of the elbow are easily damaged in fractures and dislocations of the elbow. The physician needs to be especially aware of the ulnar nerve proximally because it passes behind the medial epicondyle and the posterior interosseous nerve, wraps around the radial neck, and is most likely to be damaged with radial head fractures or dislocations or during surgery to correct these injuries. The median nerve and the brachial artery are in danger in the front of the elbow. Because the radial head is intra-articular, anatomic reduction of bone fragments is necessary to minimize the risks of lateral posttraumatic arthritis from mechanical grinding. The intra-articular position also means that soft-tissue attachments to the most proximal portion of the bone are limited, and thus, fractured fragments frequently lose their blood supply, resulting in avascular necrosis and potential nonunion. Luckily, the radial head mostly acts as a spacer preventing proximal migration of the radius; as long as it maintains its structural support, the patient may do well even if the bone dies. Except for congenital radial head dislocations, which by definition are not acquired, radial head fractures and dislocations are the result of trauma, usually from a fall on the outstretched arm with the force of impact transmitted up the hand through the wrist and forearm to the radial head, which is forced into the capitellum. Recognizing a congenital radial head dislocation (see the image below), in which the radial head is larger and rounder than expected, is important because operative treatment to reduce a congenital radial head dislocation is not indicated. The radial head is fractured in about 20% of cases of elbow trauma. About 33% of elbow fractures and dislocations include injury to the radial head, the radial neck, or both. Kodde IF, Kaas L, Flipsen M, van den Bekerom MP, Eygendaal D. Current concepts in the management of radial head fractures. World J Orthop. 2015 Dec 18. 6 (11):954-60. [Medline]. [Full Text]. Struijs PA, Smit G, Steller EP. Radial head fractures: effectiveness of conservative treatment versus surgical intervention. A systematic review. Arch Orthop Trauma Surg. 2007 Feb. 127(2):125-30. [Medline]. Jackson JD, Steinmann SP. Radial head fractures. Hand Clin. 2007 May. 23(2):185-93, vi. [Medline]. Tejwani NC, Mehta H. Fractures of the radial head and neck: current concepts in management. J Am Acad Orthop Surg. 2007 Jul. 15(7):380-7. [Medline]. Rosenblatt Y, Athwal GS, Faber KJ. Current recommendations for the treatment of radial head fractures. Orthop Clin North Am. 2008 Apr. 39(2):173-85, vi. [Medline]. Pike JM, Athwal GS, Faber KJ, King GJ. Radial head fractures--an update. J Hand Surg [Am]. 2009 Mar. 34(3):557-65. [Medline]. O'Driscoll SW, Jupiter JB, Cohen MS, et al. Difficult elbow fractures: pearls and pitfalls. Instr Course Lect. 2003. 52:113-34. [Medline]. Duckworth AD, Wickramasinghe NR, Clement ND, Court-Brown CM, McQueen MM. Long-term outcomes of isolated stable radial head fractures. J Bone Joint Surg Am. 2014 Oct 15. 96 (20):1716-23. [Medline]. Cooney WP. Radial head fractures and the role of radial head prosthetic replacement: current update. Am J Orthop. 2008 Aug. 37(8 Suppl 1):21-5. [Medline]. Schatzker J. The Rationale of Operative Fracture Care. New York: Springer Verlag; 1987. Malmvik J, Herbertsson P, Josefsson PO, et al. Fracture of the radial head and neck of Mason types II and III during growth: a 14-25 year follow-up. J Pediatr Orthop B. 2003 Jan. 12(1):63-8. [Medline]. Watters TS, Garrigues GE, Ring D, Ruch DS. Fixation versus replacement of radial head in terrible triad: is there a difference in elbow stability and prognosis?. Clin Orthop Relat Res. 2014 Jul. 472 (7):2128-35. [Medline]. Yan M, Ni J, Song D, Ding M, Liu T, Huang J. Radial head replacement or repair for the terrible triad of the elbow: which procedure is better?. ANZ J Surg. 2015 Sep. 85 (9):644-8. [Medline]. Capo JT, Svach D, Ahsgar J, Orillaza NS, Sabatino CT. Biomechanical stability of different fixation constructs for ORIF of radial neck fractures. Orthopedics. 2008 Oct. 31 (10):[Medline]. Stuffmann E, Baratz ME. Radial head implant arthroplasty. J Hand Surg [Am]. 2009 Apr. 34(4):745-54. [Medline]. Schiffern A, Bettwieser SP, Porucznik CA, Crim JR, Tashjian RZ. Proximal radial drift following radial head resection. J Shoulder Elbow Surg. 2011 Mar. 20(3):426-33. [Medline]. The radial head must be aligned with the capitellum on all views. Simple ulna fracture on anteroposterior view; radial head appears in place but see Image below. The radial head must be aligned with the capitellum on all views. Dislocated radial head is observed on the lateral radiograph. Soft tissue injury. Soft tissues are as important as bone in determining functional outcome. Isolated radial head dislocation is almost always treated closed. Minimally displaced radial head/neck fractures can be treated with early motion. Floating elbow. Combined Monteggia fracture with dislocation and supracondylar humerus fractures. 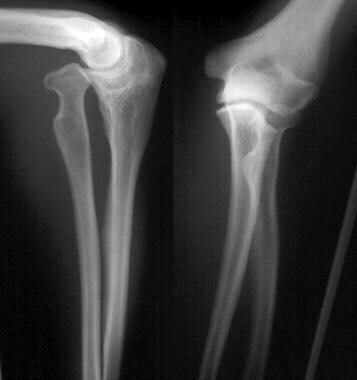 Treatment of a floating elbow requires fixation of both fractures. Radial head fracture in a child. Radial head replacement, Monteggia variant and the radial head could not be salvaged. Radial head replacement, temporary spacer. Radial head excessive excision. Do not excise distal to the annular ligament because the forearm becomes unstable. Radial head replacement, salvage with radial head spacer. Unsuccessful open reduction of Monteggia fracture-dislocation. Same patient as in Image above. Pain was resolved after hardware removal. Synostosis after Monteggia fracture-dislocation; see Image below. Improved motion after synostosis resection. Monteggia variant with radial head fracture. Fixation of both radial head and ulna.